Please note that all game footage shown in this interview is taken from the Japanese version. Following on from the Wii MotionPlus interview, I am joined today by the Wii Sports Resort development team. Let’s start by asking each of you what role you played on this project and what you worked on prior to Wii Sports Resort. My name is Kenta Sato and I work in the Software Development Department of the Entertainment Analysis and Development Division. I worked on the programming side for this project and was responsible for swordplay and table tennis. On the original Wii Sports1, I worked as a programmer on tennis. 1 Wii Sports was a title featuring five sports: tennis, golf, bowling, baseball and boxing. In Japan it was released in December 2006 at the same time as the Wii console, while in Europe Wii Sports was bundled with the Wii console. What did you work on between Wii Sports and this latest title? There was a fair amount of time between them. I worked on Wii Fit. There was a jogging2 section in the software… 2 Jogging was one of the training exercises that featured on Wii Fit. Players jogged on the spot either holding the Wii Remote, or placing it in their pocket. So the programming for that was also your handiwork, Sato-san. Okay, let's move on to you, Dohta-san. 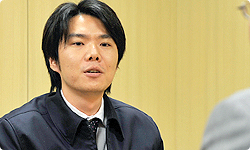 I’m Takuhiro Dohta and I also work in the Software Development Department of EAD. 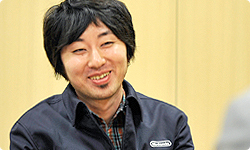 Like Sato-san, I’m a programmer, and I was in charge of boxing on Wii Sports. You really managed to pull boxing together in an incredibly short space of time. That really was a close-run thing. It kept everyone in suspense right until the last moment! After Wii Sports, I worked on a whole variety of experiments on software for Wii while also helping out a little on Wii Fit and Mario Kart Wii. 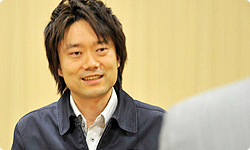 My name is Takayuki Shimamura and I also work in the EAD Software Development Department. On the previous title, Wii Sports, I oversaw the general direction of the project while also being responsible for golf and bowling. After that, I was transferred for about four months to the Special Planning and Development Division. You took part in a kind of short-term study tour within the company, didn't you? You could say that! (laughs) During my time at the Special Planning and Development Division, I was in charge of direction for Sight Training3 on DS. Following that, I returned to EAD and worked with (Keizo) Ota-san… I believe Ota-san took part in the Wii MotionPlus interview. 3 Sight Training: Enjoy Exercising and Relaxing Your Eyes was released in Japan in May 2007 for Nintendo DS. It was released in Europe in November 2007. Yes, that’s right. He told us all about his bitter struggle with the awkward piece of kit that is the gyro sensor. I was working alongside Ota-san in doing experiments to assist the creation of new software, and as a consequence I became involved in the development of Wii Sports Resort. And finally over to you, Yamashita-san. My name is Zenichi Yamashita and I also belong to the EAD Software Development Department. On Wii Sports, I was responsible for baseball and boxing. Once that title was complete, I took it easy for a while before working on the Mii Contest Channel. 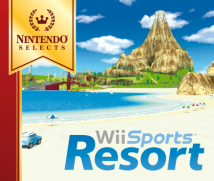 I have been involved with the development of Wii Sports Resort since around March 2008. What I’d like to ask each of you first of all is what you think of Wii MotionPlus. When you initially had the concept explained to you, what did you make of it? Yes, it was because of this experience that you were asked to join the Wii Fit team and create the jogging section4. Miyamoto-san pushed for its inclusion rather forcefully, but I'm very glad that it ended up in Wii Fit. 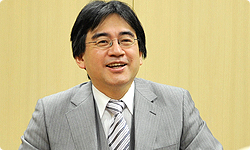 4 For more details, please see the Iwata Asks interview about Wii Fit, Volume 1: Exercises Using All Sorts of Ideas. Working on those experiments, there were times when I ran up against the limitations of the Wii Remote accelerometer and would find myself wanting to make this movement or that movement but finding that the sensor wasn’t able to detect it. The accelerometer on its own does have limitations in terms of detecting precisely how you moved or rotated the Wii Remote. That’s why I was extremely excited when I heard about the new sensor. I thought that if we used that, all those things we hadn’t been able to do up to now would become possible. I see. How about you Dohta-san? In the same way as Sato-san, I was involved in experimenting with different movements of the Wii Remote which could be utilised in software. Then, just as I was starting to feel that we had exhausted all the possible movements, I heard about the gyro sensor and felt that all these new possibilities had opened up. What did you think, Shimamura-san? When I was working on golf for Wii Sports, Miyamoto-san would constantly say things like: "Simply using brute strength when you swing is no fun!" So when I heard about the concept for Wii MotionPlus, I thought that issues like that would now be easy to resolve. When I first heard about it, I too felt a sense of pure anticipation. I wasn't sure at that point what kind of things would become possible, but I remember feeling tremendously excited. So what did you think when you first got the chance to actually get your hands on Wii MotionPlus and use it? Let’s ask the two of you who had worked on programming for the Wii Remote from the start. I’m glad to hear you giving your honest opinion! At the start of the development process, there were indeed a variety of problems to contend with, such as the narrowness of the detection range and the sensor’s inability to detect slow movements. Dohta-san, how about you? 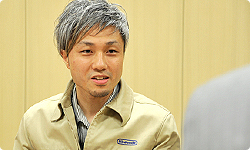 I had the same kind of impression as Sato-san, but I was still very taken aback by the responsiveness of Wii MotionPlus when I first had the opportunity to use it. What precisely do you mean by responsiveness? Did you feel that there was a difference in the precision of the controls? Exactly. It felt very new and fresh. "You can make it stop?" There was this programme that Ota-san came up with. Ah, this must be the SDK5 that Ota-san put together. 5 An SDK or Software Development Kit is a component used in the development process of games. We were saying: "Look, you can make it stop at the last second6!” (laughs) 6 The term used in the Japanese is sundome which is a term used in non-contact karate that refers to stopping at the precise instant before making contact with an opponent. With the original accelerometer, you couldn’t make a sudden stop like this. There was always this slight sense of a delay before anything came to a halt. Regardless of the angle at which the Wii Remote is held, the accelerometer can only detect the position it's in once the Wii Remote has stopped. This means that while it’s in motion, it can only make predictions about which way gravity is acting upon it. So that’s why it wouldn’t come to a clean stop and there would be this slight drag. With Wii MotionPlus attached, however, it recognises the Wii Remote’s position whether the user is beginning to move it or is bringing it to a halt. Video: if you move the Wii Remote, the doll on the screen will move in real time and if you stop moving it, the doll will come to a complete halt.